Lack of use, however, is rarely good for anything. Cars, people, and yes, even the majority of digital data, need to be active. Inactive data can introduce risks and can also be a symptom of a much bigger information management problem that, if left un-checked, will eventually degrade business operations and decision-making. 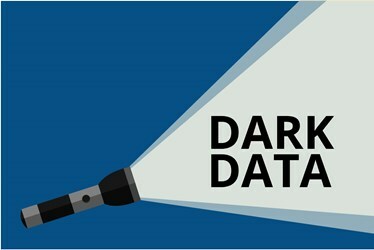 Dark data includes some data that should be deleted or archived rather than left inactive and unmanaged. Most dark data, however, needs to remain where it is. The current conditions of the business world require that past activities are well documented and recorded, and that data can be accessed and, if necessary, re-purposed months or even years later. Some content assets are meant to be designated as dark data and intended to remain invisible to certain individuals because they contain sensitive or private information. For instance, HR collects and stores personal information about employees. Across all departments, confidential company information and proprietary digital assets such as design files, sales proposals, marketing strategies, and other intellectual property needs to be secured and visible only to authorized individuals. On the other hand, some dark data, if not managed properly, can expose a business to numerous risks. Distributed and duplicated content, without explicit oversights, weakens security. Hackers have more potential entry points, and leaks can result in damaged reputations as well as loss of competitive strength. Theft or loss of laptops and personal devices can also put dark data in the wrong hands. When employees leave an organization, dark data might go with them, or might be set aside or added to a manager’s own dark data. 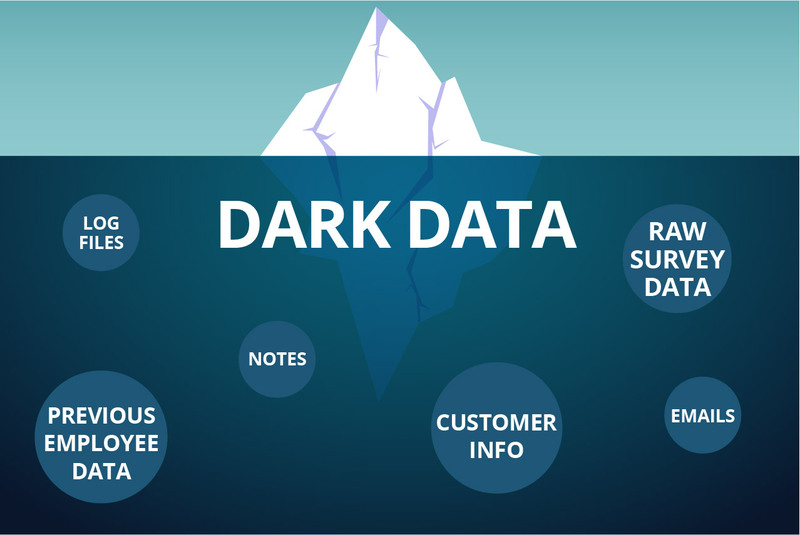 Besides the risks associated with lost, stolen, or breached dark data, unmanaged dark data can drive up the costs associated with eDiscovery or forensic data analysis activities. The sheer volume of dark data impacts the costs for searching and producing appropriate information. Similarly, but without the same risks, the magnitude of unnecessary dark data can also impose a wasted storage cost in operating budgets. One person’s dark data can and should be another person’s active data, if it is revealed to them in the appropriate context and with effective access and authorization protocols in place. Many organizations are introducing enterprise information management (EIM) solutions that make this possible. Intelligent tagging of designated categories of unstructured content and structured data combined with advanced search capabilities enables the ability to discover relevance within dark data regardless of location and format. The advantages of reactivating dark data are many, starting with avoiding the duplication of content and effort. Information can be more broadly shared when it is more broadly visible, and organic collaborations will be fostered by the information that is leveraged for multiple tasks and processes. Decision making that takes into account all of the related information — including content that might have gone dark — extracts as much value as possible from an organization’s continually growing arsenal of information assets. For example, the decisions relating to the strategy for a particular customer account should consider as much history about that customer as can be collected. An EIM solution that can find and intelligently organize all of the information about that customer can give decision makers a powerful and extensive single pane through which to view and analyze the account. Any organization that wants to decrease the risks and increase the value stemming from diverse information repositories should take dark data into account. As mentioned, some dark data should remain dark (i.e., saved but inactive); some should be deleted; and some should be discoverable across functional areas and business systems. A solid first step, therefore, is the definition and implementation of data rules and desirable data behaviors. An EIM solution that increases visibility and supports versatile classifications of data provides a more intelligent foundation for data. Classification, or tagging, makes it possible for individuals to find relevant information regardless of its location. The enhanced discoverability prevents valuable data from going dark. Best-in-class EIM solutions also promote automated implementation of policies that will ensure that data and content are actively managed at all stages of the information lifecycle. After the introduction of this layer of information intelligence, an organization can then take the next steps toward more tightly integrated information systems. An EIM solution that integrates with core business systems such as ERP, CRM and other applications helps to eliminate information siloes by enabling content to be accessed from any system at any time. Employees can have quick and easy access to the most relevant content based on the task at hand. Searches can be personalized and information can be tailored to each individual user. Industry analysts have referred to this scenario as “content in context” and are evangelizing this approach as more intuitive and flexible, and ultimately as the future of information management. Current EIM solutions are already fostering environments with less dark data, and with less risks associated with dark data. With increased visibility and more discoverability, a portion of otherwise dark data is also being more actively used. And while some dark data will always exist, increased awareness and intelligent information oversights will ensure that dark data remains a small slice of the enterprise information pie. Mika Javanainen is in charge of managing and developing M-Files product portfolio, roadmaps, and pricing globally. As a Director of M-Files Product Management Unit, he leads and supervises M-Files Product Managers and works closely together with M-Files Product Development and Marketing teams to design and develop new products and features leveraging his long experience with ECM and M-Files technology. Mika has executive MBA Diploma in International Business and Marketing.